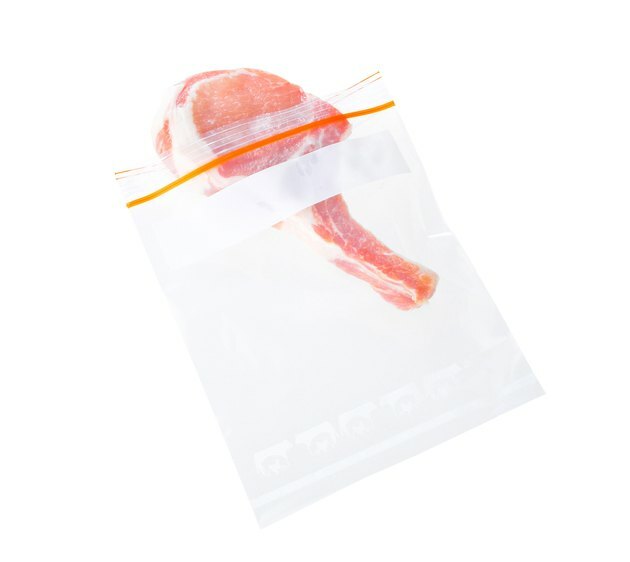 Oven bag cooking offers a way to keep the meat moist as it roasts without all the cleanup. The bag holds the moisture in as the pork cooks to provide natural and effortless basting. Any pork cut that you cook in the oven should work well in a bagged environment. Before beginning, you should take the time to read through the instructions that come with the bag. Manufacturers offer different ways to use the bag that will improve the performance and reduce incidents of breakage. Season the pork as desired. Depending on the cut, you may want to marinate the meat prior to baking. For example, if cooking pork ribs, brush barbecue sauce over the surface of the ribs. If cooking pork chops, add a sprinkle of salt and pepper. Pour flour into the bag and shake it around to coat the interior. Follow the directions on the bag for the amount of flour to use. Some oven bags require at least 1 tbsp. flour to absorb juices from the pork so the bag does not burst. Cuts such as ribs might require additional flour because they are fattier. Place the pork into the bag and lay it inside a large baking pan. Use a dish that is at least 2 inches deep. The pan should allow the bag to expand as the meat cooks without any area touching the sides of the dish. Cut four to six slits in the top of the bag to allow for venting. Bake the pork according to the directions on the recipe. For example, cook pork ribs for 1 1/2 hours or bake chops for 25 minutes. Not all oven bags have the same design. Read the documentation that comes with your bag thoroughly and follow any safety instructions for that product.